Did you know there are people who don’t even realize that they make mistakes while pronouncing their own names? Note – Click on the highlighted words to see the meanings. You already know why correct pronunciation is important. It’s time to know our articulators and how they help us in improving pronunciation. Pronunciation can be as easy as listening to a sound and mimicking it and as difficult as trying to understand how a sound is pronounced and inability to use the articulators correctly, due to lack of control. Articulators are the organs that make it possible for us to speak. If there is even one articulator missing or has some defect, then we won’t be able to speak all of the sounds. But before we see all the articulators, we should know what is the most important element needed for speech. Try this – hold your breath and say ‘hi’ without letting any air in or out. Now try ‘hello’. Can you hear a sound coming out? If yes, then you are letting some air out, or you are imagining the sound. Airflow is extremely important to produce speech. Without air, you can move your mouth but can’t create sound. What provides us with this flow of air? Our lungs. Although we get air from the surrounding, we use the airflow coming from our lungs to speak. This means we speak when we exhale, not while we inhale. Try and feel it yourself. All of the articulators mentioned above are extremely important for correct pronunciation of all the sounds. If you have control over your articulators then learning to pronounce something will be an easy task for you. Let’s try to understand the use of all of these articulators. 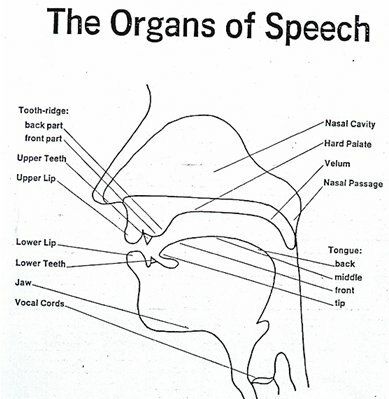 These organs are used in all the spoken languages in some of the other ways, but I will be giving examples of English sounds as we are concentrating on English. We’ll start from top to bottom. In this article, we will try an understand the first 5 and in the next article the next 5. Our nasal cavity is the hollow area which helps us breathe and to produce nasal sounds. There are some sounds which only use this nasal cavity to resonate. In this case, the air passes through the nose instead of mouth or partially passes through the mouth. Lips are highly important for producing speech. They take part in all the sound formation by taking some kinds of shapes. Speak them one by one and pay attention to your lips and how they change shape. When we say ‘B’, we start by touching our lips and then releasing them. When saying ‘X’, we stretch our lips out. With ‘M’ we close our lips tightly to let the air out of the nose. Try to say “mmmmmmm…” while keeping your mouth open. Does it sound like ‘mmmm’? No. The sound will change. Now say “oooooooo…” but open your mouth wide, bigger than usual. If you do this, you will end up saying “aaaaaaaahhhh…” not “oooo…”. For every sound to be precise, you need to form a particular shape, otherwise, the sound will change. A small change in this shape can create an absolutely different sound without you noticing it. Teeth don’t just help us with chewing food, but with pronunciation as well. They block the airflow to help us produce sounds. Examples – make the sound of a snake “ssssssss…”. Do you feel your teeth? What are they doing? The upper and lower teeth come together and meet at the tip, so the lower teeth are NOT behind the upper teeth but in the same alignment. Only then the correct ‘ssss…’ sound can be produced. There are some variations in the articulation, but then the sound is not clear and affects the pronunciation of the word. The alveolar ridge is right behind the upper teeth and attached to them. It feels like a swollen area of gum and is a thick bump. This area is used a lot more by us than we know. It is used for productions of consonant sounds by obstructing the air flow when the tongue touches or comes close to it. Many English consonants are dependent on the alveolar ridge to be spoken correctly. Example – say “llllllllllll…” you will feel your tongue touch the alveolar ridge. Try to remove the tongue from its place and you won’t be able to pronounce the sound. The other examples are the sounds of ‘d’, ‘n’, ‘t’. Hard palate starts just after the alveolar ridge and is connected to it. It separates the mouth from the nasal passage and is an important speech organ. The palatal consonants (consonant sounds which use the hard palate) involve a part of the tongue coming close to the hard palate and helping in the pronunciation of the sound. There are 2 palatal consonant sounds in English – ‘y’ and /ɲ/. Example – In ‘Yes’ when pronouncing ‘y’ the tongue moves close to the hard palate. These articulators play a great role in pronunciation. Understand these 5 articulators and read part 2 here. Try and understand the usage by paying more attention to them while speaking and see how frequently we use these. Do comment and share your thoughts or questions. I tried this and now I can see the different in my pronunciation..
That’s good to know. It can be quite fun too. Keep observing! !